Appearing in court can be daunting and stressful. Parents of children who have been removed from their homes amid concerns of abuse or neglect aren’t immune from this effect. Yet when the guidance of a qualified lawyer should be standard, parents more often are represented by attorneys who have limited experience and understanding of child welfare law and practices. 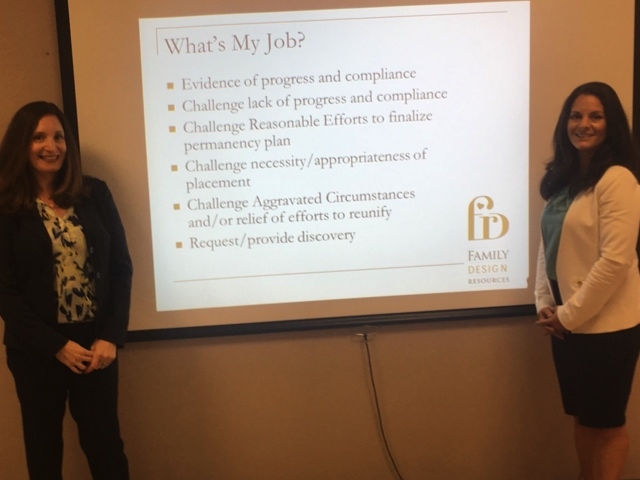 “It's not just the rights of a child but also the constitutional and fundamental rights of parents to the care, custody and control of their children,” said attorney Alyssa Holstay, legal services training specialist with Family Design Resources. Strong legal representation for parents also is an issue of societal justice. “We are talking about children who allegedly have been abused or neglected, so society says ‘Who cares about the parents?’ ” Holstay said. When children are removed from their families out of concern for their safety and well-being, services are provided to the families with the goal of reunifying children and parents as soon as possible. Supporting parents, in essence, supports the children. Meanwhile, without proper parent representation, more children may need adoption, placing a heavier burden on society. In 2013, Holstay was appointed a parent attorney by Dauphin County Orphans’ Court. One of her clients was Valerie (not her real name to protect confidentiality), a mother who, for a variety of reasons, was not able to care for her children. Reunification with parents, the highest form of permanency for a child, was not an option for Valerie’s children. Act 101 of 2010 had been in place for a few years at that point, but it was still relatively new in terms of putting post-adoption contact agreements into practice. This portion of the law offered the potential for Valerie and her children to remain connected. Holstay, with consensus from the other attorneys involved, researched the options and drafted an agreement amenable to all parties, which the judge accepted. “The prevailing belief is that the judge makes the decisions in ‘kiddie court,’ but it’s a lot more complicated than that,” Holstay said. "Child welfare is complex and requires sound knowledge of the law. Better legal representation ensures a better, timelier outcome." Parent representation is a part-time focus for most attorneys. Unless guided by a strong ethical compass, they have little motivation to become educated on parent representation. The lack of proper legal training affects the court process; hearings may take longer, for example. When an attorney’s ineptitude results in parental rights being terminated gratuitously or visitation being limited, families may be irreparably harmed. Family Design Resources is addressing this need for specialized and comprehensive child welfare legal training under its initiative called the Legal Partnership for Permanency®. On June 7 in Chambersburg, Holstay and attorney Ilene Dubin, a fellow legal services training specialist, outlined a pilot training program called, “Understanding the Dependency System for Parent Attorneys and Guardian ad litems.” Guardian ad litems, or GALs, are court appointed to investigate which solutions are in the best interest of a child. The six-hour training program, sponsored by Franklin County Children and Youth Services, provides an overview of the juvenile dependency system and is designed to equip parent attorneys and GALs to represent families better. FDR intends to replicate the training elsewhere in the state. Holstay noted the request for training came from Franklin County President Judge Carol Van Horn and county solicitor Theresa Yaukey, who recognize that improved legal practice in child welfare cases will better serve the families of Franklin County. This is the same progressive attitude shared by the judge in Valerie’s case, in which an agreement with the adoptive parents allowed Valerie to maintain contact with her children. For more information on FDR’s Legal Partnership for Permanency®, contact us by clicking here. Photo: Ilene Dubin, left, and Alyssa Holstay, legal services training specialists with Family Design Resources.